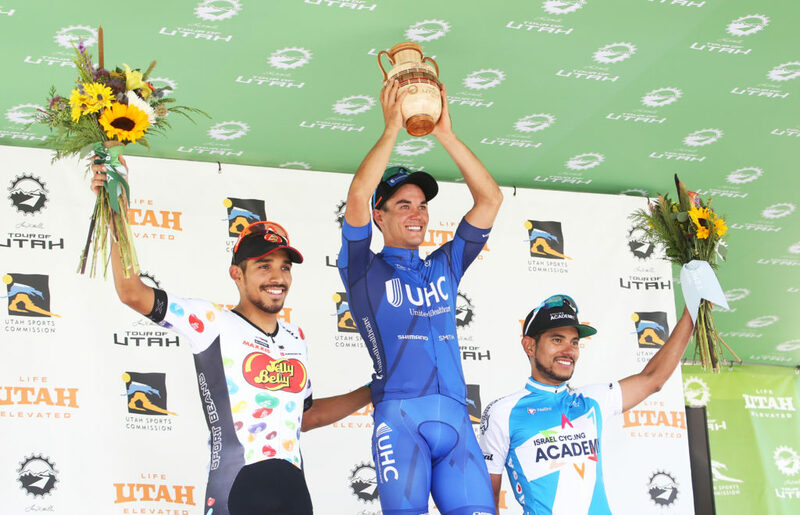 By Lyne Lamoureux – Travis McCabe of UnitedHealthcare Pro Cycling Team surged past the field in a chaotic sprint finish to win Stage 1 presented by America First Credit Union at the Larry H. Miller Tour of Utah on Tuesday. “Coming into this, I trained really hard. I've had a few months now of just being home and training. Utah was a big goal,” said McCabe, who lives and trains in nearby Arizona. He took advantage of a late race attack by his teammate Serghei Tvetcov to claim his third stage win in three years at the Tour of Utah. A bike length separated McCabe from second-place Ulises Castillo of Jelly Belly Cycling Team p/b Maxxis, and Edwin Avila of Israel Cycling Academy following in third. Overall race leader Tejay van Garderen of BMC Racing Team retained his Larry H. Miller Dealerships leader’s yellow jersey by finishing safely in the peloton. By capturing the 10-second finish time bonus, McCabe moved up to second in the General Classification (G.C. ), only two seconds back. Joey Rosskopf of BMC Racing Team is in third place overall, a further two seconds down. Fourth in the G.C., Neilson Powless of Team LottoNL-Jumbo retained the WCF Insurance Best Young Rider jersey. 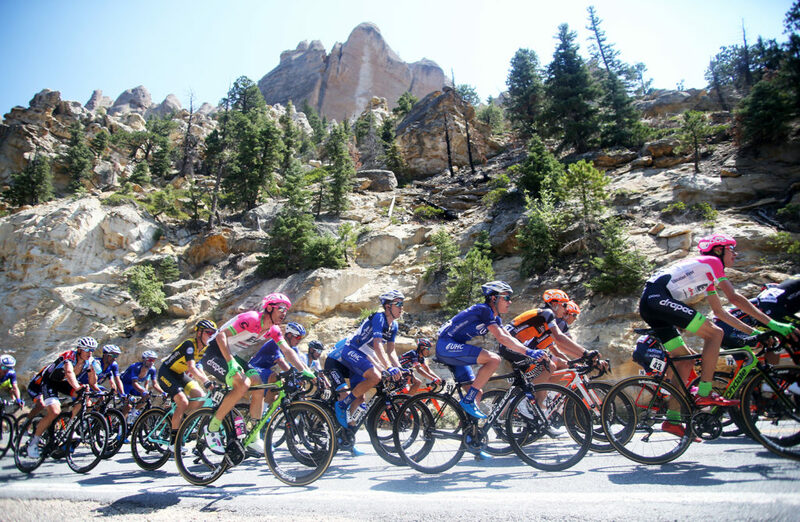 Blue skies and warm weather greeted the 115 racers at the start of Stage 1 presented by America First Credit Union in the fourth-time host city of Cedar City. The start and the finish were held on the campus of Southern Utah University. After a flurry of attacks in the first 40 minutes of racing, four riders managed to escape to form the main breakaway of the day. Evan Huffman of Rally Cycling, George Simpson of Elevate KHS, Daan Olivier of Team Lotto NL-Jumbo and Lionel Mawditt of Jelly Belly pb Maxxis worked well together to increase their lead. The four escapees built a lead that grew to over five minutes before starting to climb up Parowan Canyon for the highest climb of the week near Cedar Breaks National Monument, topping out at 10,600 feet. “It was the first time I raced at this altitude which makes it pretty hard, but I think it was a really nice climb. The steep gradients I like, so I enjoyed it,” said Olivier about the Category 1 climb, which gains 4,500 vertical feet in 15 miles, with some sections at Brian Head Ski Resort challenging riders with a 15 percent gradient. After re-forming on the descent, the break shattered on the next KOM at Bristlecone. Under pressure from the chasing peloton, Olivier continued solo and claimed the Utah Office of Tourism King of the Mountain jersey. With 20 miles to go, the gap to the lone rider was down to under two minutes with teams chasing to bring about a bunch sprint. One team that did not participate in the chase was UnitedHealthcare. “I really had to just make it up over the big climb. It was a pretty fast pace, we lost a few of the bigger sprinters like Ty Magner on that climb because of the tailwind. Pace was pretty hard, we were on the pedals the whole day. We were expecting that. We didn't really contribute too much to the chase because we could tell that guys on the breakaway were starting to come off, a little early on, like 90 K in the race. We let it play out,” McCabe explained. Attacks were launched from the front. Luis Lemus of Israel Cycling Academy took a solo flyer with 20 kilometers to go, caught and passed Olivier as he approached Cedar City. But his move was doomed. More attacks flew from the field as they raced around the finishing circuits. “In the sprint, there aren't really any big sprinters team because it's such heavy climbing race this year so I floated along, waiting for the opportune time for me to sprint, opened it up with 250 meters to go and won,” said McCabe. McCabe also claimed the Utah Sports Commission Sprint jersey. Nathan Brown of EF Education First-Drapac p/b Cannondale was voted America First Credit Union Fan Favorite, in the category of Best Ambassador (Statesman). Stage 2 on Wednesday, Aug. 8, returns to Payson City for a third time. The focus of the day will be the towering peak of Mount Nebo, making a seventh appearance in the Tour that was last featured in 2016. This year, the 88.6-mile (142.6 km) route will start and finish in Payson City. After a 12-mile circuit north of town into Utah County, the race will return to Payson for a sprint in front of historic Peteetneet Museum and pass through the start/finish area at Memorial Park. The route will then travel south through the orchards and lavender fields along Old U.S. Highway 91 for a sprint line in Nephi, then the final push on the Category 1 ascent across Mount Nebo. The cyclists will summit the roadway at 9,300 feet for the one KOM on the day, then have a twisting 22-mile descent for the finish back into the classic western town of Payson.